The ozone layer shields the Earth against harmful ultraviolet (UV) radiation coming from the Sun. 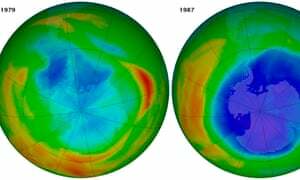 Man-made CFCs and other chemicals used in refrigeration, aerosol sprays and air conditioning are destroying the ozone layer, allowing more UV radiation to reach the Earths surface. This could pose problems for human health and the natural environment. Fortunately, most ozone depleting chemicals have or are currently being phased out, but because they have long atmospheric lifetimes, ozone depletion will continue to be a problem until well into the 21st century. Data for the production and consumption of ozone depleting chemicals still in use provide a reliable indication of quantities of substances being released into the atmosphere. Levels for stratospheric ozone are provided by satellites, which monitor the thickness of the ozone layer over selected sites.